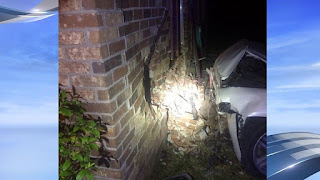 Berkeley County deputies are investigating after a car crashed into a home when it failed to pull over and ran | Crime Stoppers of the Lowcountry: 554-1111 | 1-888-CRIME-SC | Anonymous tips earn cash rewards with Crime Stoppers of the Lowcountry. BERKELEY COUNTY, S.C. (WCIV) — Berkeley County deputies are investigating after a car crashed into a home. Road on a white Acura sedan around 8 p.m. Wednesday night but the driver sped away. They said they didn't give chase since the car was "considerably quicker and showed no signs of desiring to stop." The car went down Old Back River Road before failing to maneuver a turn and crashed into a home on Princeton Road. The driver ran off and BCSO deputies are still looking for him. They did find about half a pound of marijuana in the car. One person inside the home suffered minor injuries. No suspect information is available but deputies said it is "expected that he will be caught." If anyone knows anything about this or any other crime, they are asked to call Crime Stoppers at 554-1111.